Want to Learn More About the USS Arizona in Hawaii? There’s an App for That! When you book a Pearl Harbor Basic Tour or a Pearl Harbor Home of the Brave Tour through Hawaii Aloha Travel, your tour guide will offer guidance, information, and context so you can enjoy your visit to the fullest. But, you’ll soon have another tool at your disposal that can make your visit even more unique and profound — a new app that will provide a first-hand account of December 7th, 1941 directly from the mouth of someone who was there. According to the Honolulu Star Advertiser, Lauren Bruner, 95, is one of only seven USS Arizona survivors still alive today, and he was the second-to-last to leave the burning and sinking USS Arizona when the Japanese launched a surprise attack on Pearl Harbor. Now, he’s teamed up with his friend and business partner Ed McGrath, and Roberts Hawaii, one of Hawaii’s largest and oldest transportation companies, to introduce an app that will help users catch a glimpse of what it was really like the day the USS Arizona in Hawaii was bombed and sunk. The Honolulu Star Advertiser reports that the smartphone application, developed by Roberts, will be out as early as January. It will walk visitors through a bit of Hawaii in late 1941 — through Bruner’s eyes and period photos — immediately before, during and after the day of infamy. “I think most people, immediately, when we tell them about Lauren’s tour, they think it’s an oral history,” former Hawaii and now California resident McGrath told the Honolulu Star Advertiser. But it’s not an oral history, he said. The new “Voices of Pearl Harbor” tour uses a folksier approach, with acoustic guitar and ukulele music playing in the background as Bruner talks about the waterfront and Waikiki, circa 1941. 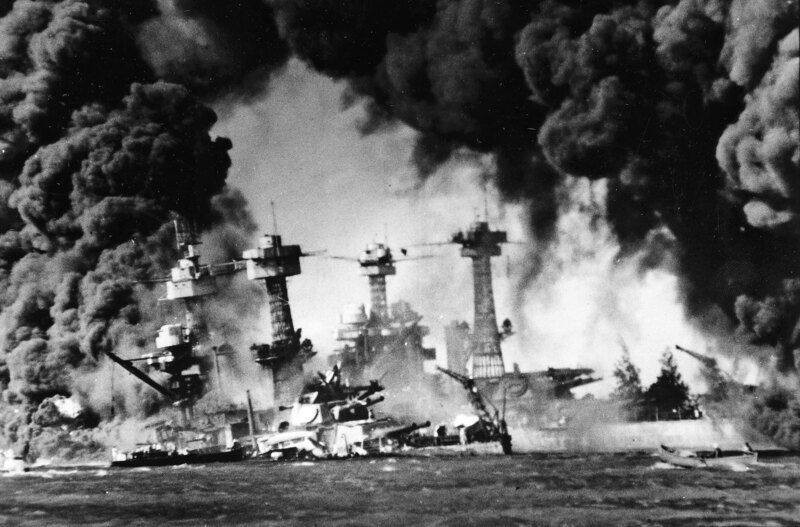 The attack on Pearl Harbor prompted the United States' involvement in World War II. The Honolulu Star Advertiser reports that Bruner’s descriptions are synced with points along the boat tour and sights on the memorial, which McGrath likens to “walking back in time with a favorite uncle.” The Pearl Harbor survivor is no radio announcer — and admits it — with emotions from the past trauma evident at times in the narration. “Imagine for a moment the imposing sight of those battleships similar in size as the Missouri, all in a line and berthed within 50 yards of one another, and close enough so that at night when things were quiet, you could often hear sailors joking and laughing with one another or playing a guitar on a ship near you,” the La Mirada, Calif., resident told the Honolulu Star Advetiser. The Arizona Memorial “assembly room” straddles the spot Bruner was near while thinking about plans — soon dashed — for what was then still a peaceful day. Part of the reason for creating the narrated tour was the desire to fulfill Bruner’s goal of remembering his 1,177 fallen shipmates. In fact, Roberts’ president and chief operating officer Percy Higashi told the Honolulu Star Advertiser Roberts will donate about ten percent of the $7.50 phone app tour price to the new nonprofit Lauren F. Bruner USS Arizona Memorial Foundation, which is intended to help maintain and honor the memorial. McGrath told the Honolulu Star Advertiser he and Roberts are developing other “Voices of Pearl Harbor” tours with Walter Beyer, 97, who served on the USS Bowfin submarine on missions that included penetrating a Sea of Japan minefield late in World War II, and battleship Missouri veteran Jack Bollinger, 90, an eyewitness to Gen. Douglas MacArthur’s shaking hand as he signed Japan’s surrender on Sept. 2, 1945. Telling the stories of deceased Dec. 7 pilots Ken Taylor and Phil Rasmussen is also planned through past interviews, McGrath said. The tours will be available to the public through the Roberts website and from Google and Apple, the company said. The fireball caused burns over more than 70 percent of Bruner’s body, but he found the strength to climb a rope 100 feet hand over hand to the repair ship Vestal. The last to leave was Alvin Dvorak, burned over 80 percent of his body. Dvorak died 17 days later on Christmas Eve. 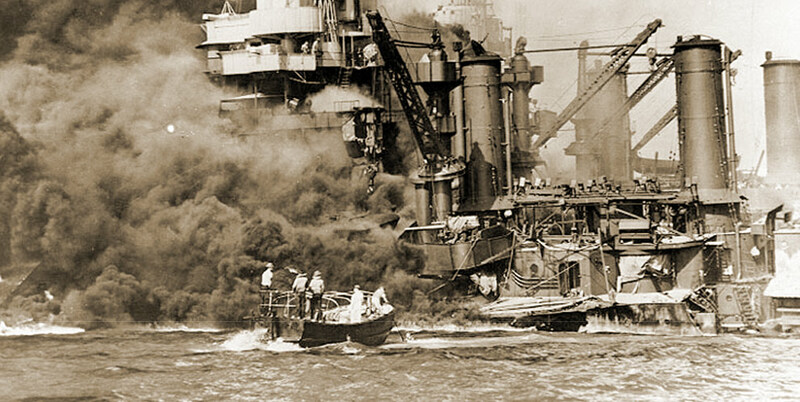 Battleship USS West Virginia sunk and burning at Pearl Harbor on Dec. 7, 1941. In background is the battleship USS Tennessee. Bruner, who visited his ship again Saturday with about 30 people, including friends, Navy families and Roberts and National Park Service representatives, was relatively quiet, as he always is when he returns to the spot of so much personal loss 74 years ago. And, now, you can get an even more in-depth look at the events that shaped the modern world as we know it.